This is a tough one, speaking as one of the few people who preferred Peter Dolving-led The Haunted to Marco Aro, even when this led to forays into experimental territory like The Dead Eye and Unseen. Aro, after all, has a bland death-thrash growl, while Dolving's voice is unmistakeable, charismatic, and sounds like a man pushed beyond the point of homicidal rage. Aro's albums (to date Made Me Do It and One Kill Wonder) felt like thrashier melodeath; very good, but not always what The Haunted mean to me. Yet even I have to admit that while Unseen was a fun listen, it was a bit all over the place, the sound of a band really not sure what they should be sounding like. And so Dolving left and Aro joined, for the second time in the band's history, and Exit Wounds, the band's eighth full-length, is released quietly before At The Gates drop their comeback later this month and ensure that everyone forgets about this. Sadly, Exit Wounds is a forgettable album, if a solid one. The first few tracks are killer, Cutting Teeth and My Salvation being powerful and aggressive thrashers, the sort of thing that should have become the norm post-Slayer – crunching thrash riffs barrelling along under a throaty bellow that proves that Aro is putting his heart into this. Things get slightly repetitive after that, however, with Psychonaut feeling like a retread, and Aro's blandness as a vocalist hurting the songs. Eye of the Storm is catchy enough to stand out (as the first single, it damn well should be) with some good soloing from Patrik Jensen and Ola Englund. Yet Trend Killer falls weirdly flat with its ridiculous lyrics criticising other bands for following trends. Come on, The Haunted, you're better than this, Swedish grammies and all. Quality control is a bit all over the place, afterwards, with a noticeable shift towards a groovy Lamb Of God style on Time (Will Not Heal) that takes a couple of tracks to shake off. Temptation kicks out the jams with a return to thrashy speed, despite a horrendous attempt at clean vocals, and the one-minute long My Enemy is a nice nod to the brutality of One Kill Wonder. This War and Ghost in the Machine are nice late-album high points, but part of the problem is that there's still too much filler and padding out, too much slowing down and meandering, when the perfect Haunted album is short, sharp, and absolutely killer, the best parts of Made Me Do It and rEVOLVEr put in a blender and swallowed by a VERY ANGRY MAN who wants TO KILL YOU. 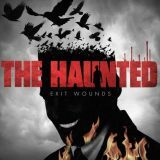 Exit Wounds is a lot better than I feared it would be, and it makes the wait for new At The Gates easier, but even manic Haunted fans will find it hard to care too much about this.